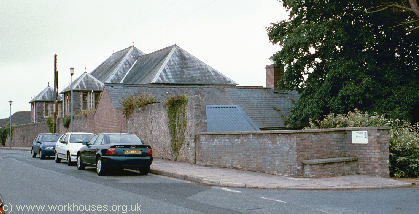 St Mary's parish in Pembroke had an early workhouse in Long Entry, Westgate. A parliamentary report of 1777 recorded parish workhouses in operation at: St Florence (for up to 5 inmates), Lawrenny (10), Manerbier (20), and Mouncton (26). County of Pembroke: Angle, Bosheston, Burton, Carew (2), Castle Martin, Cosheston, Gumfreston, Hodgeston, Lamphey, Lawrenny, Llanstadwell, Manorbier, Mouncton, Nash, Pembroke, St. Mary (4), Pembroke, St. Michael (2), Penally, Pwlcrochan, Redburth, Rosecrowther, Rosemarket, St Florance, St Petrox, St Twinell, Stackpole, Tenby - St. Mary (In Liberty) (2), Tenby - St Mary (Out Liberty), Upton, Warren. The population falling within the Union at the 1831 census had been 17,191 with parishes ranging in size from Upton (population 6) to the combined parishes of Pembroke (5,343). The average annual poor-rate expenditure for the period 1834-36 had been £5,842 or 6s.10d. per head. At their first meeting on 7th January, 1837, the new Pembroke Board of Guardians elected Earl Cawdor of Stackpole Court as their Chairman. It was decided to build a new Union workhouse, although in the interim, the union's paupers continued to be housed in existing parish workhouses rented by the Union. A three-acre site on the north side of the Pembroke River was bought for £450 from John Adams of Holyland. The new building, intended to accommodate 180 inmates, was was designed by George Wilkinson of Witney. The building contract for £2,650 was awarded to Thomas Evans of Carmarthen. The first inmates moved into the workhouse on 24th December, 1838, although the building was not finished until the middle of the following year. The final cost of the workhouse was £4,998.13s.4½d. George Wilkinson was the architect of many other union workhouses in England, Wales and Ireland. Pembroke, built in Wilkinson's favoured Elizabethan style, was based the Commissioners' model cruciform or "square" layout. The workhouse location and layout are shown on the 1908 map below. The entrance block had a two-storey central section containing two entrances, the one at the west leading to the porter's lodge, and the one at the east leading to the board-room and the office of the relieving officer. Single-storey wings at each side, now gone, contained a probationary ward at the west and clerk's office at the east. 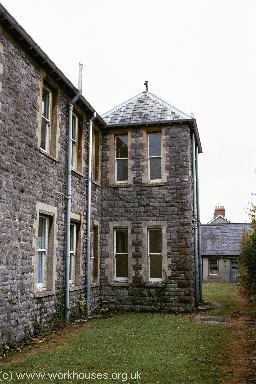 Pembroke entrance block from the south, 2000. 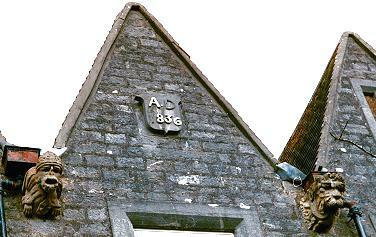 A date plaque above the entrance appears to read "1836" but the final digit has probably rotated due to damage at some time and should really read "1839". To the rear, a central range containing the kitchens led to the central hub containing the dining hall on the ground floor and master's quarters above. Wings to the east and west accommodated males and females respectively, with day-rooms on the ground floor and dormitories above. The area between the entrance block and the side wings formed separate boys' and girls' exercise yards. At the rear of the hub, the chapel ran northwards, with male and female yards at each side, leading to a row of utility buildings. On the female side, these included a washhouse, drying room and laundry. A mill room was placed at the centre where the men ground corn. An infectious ward block was placed on the men's side — an odd location since access for the female pauper nurses would need to pass through the men's side in order to enter it. A separate block at the rear contained male and female idiot wards each of which had a small enclosed yard. The first Master and Matron of the workhouse were Mr and Mrs J Large, appointed at a joint salary of £70 per annum. A porter was appointed at £15 and a female cook at £10 per annum. The first nurse, Mary lewis, was taken on in July 1839 at two shillings a week — she was later reprimanded for being drunk. A porter's lodge was added just inside the workhouse gate and a vagrants' ward was added nearby in around 1850. The workhouse had its own piggery which continued in use until the 1950s. In 1840, a boundary wall was erected and garden laid out where potatoes were grown. Water for the workhouse came from a spring at Cold Well Field near Golden Hill which was leased at £1 per annum with the water being piped down to the workhouse. In 1903, a large new infirmary was erected at the north of the site, replacing the old idiot wards. It was designed by EH Lingen Barker of Hereford and built by Daniel Evans and William Morgan of the Green, Pembroke at a cost of about £4,000. In 1906, the laundry wing was totally refurbished by local builder Rees Phillips at a cost of £323. Pembroke 1903 infirmary from the south-east, 2000. Pembroke 1903 infirmary from the east with vagrants' block beyond, 2000. In 1908, a scandal developed when a nurse named Wragg made an accusation of assault against Charles Flutter, the workhouse master since the 1870s. A Local Government Board inspector made an investigation of the entire administration of the workhouse. Although Flutter was cleared of the allegations of impropriety, he was found to have permitted abuses and indiscipline to creep in. In February, 1909, Mrs Flutter resigned as Matron due to ill-health and the Guardians decided not to extend her husband's contract. The new Master and matron were Mr and Mrs Roberts, the workhouse's first trained and qualified administrators. Work done by the male inmates include oakum-picking. The women, if not engaged in domestic work, were given spinning wheels, knitting needles and wool to knit stockings. The workhouse uniform for men included coats and waistcoats of fustian (a coarse twilled cotton with a velvety pile), corduroy trousers and clogs. An official inspection of the workhouse school in 1848 found that the school-room was airy and well-lit, and that the reading and spelling of the children was good, as was their discipline. It was noted that few of the children had stockings, and one had no shoes, despite the snow on the ground. The workhouse school-master was Edward Shaw, a former soldier from Worcestershire, who had the boys marching around the yard, saluting him as they passed. 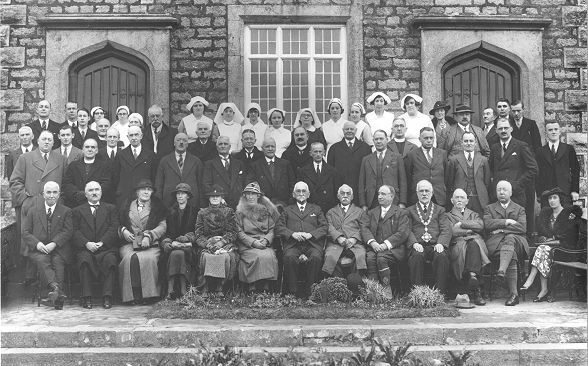 In April 1930, the workhouse system officially came to an end and control of the site passed to Pembrokeshire County Council. The photograph below may have been taken at the final Board of Guardians' meeting in around 1931. At the front centre in the fox fur is Lady Meyrick who was still very much involved in the hospitals' management committee in the 1950s. The new Public Assistance Institution continued to provide accommodation for the elderly and for vagrants, and the infirmary took on the name of Woodbine House Hospital. During the Second World War it provided care for war casualties. 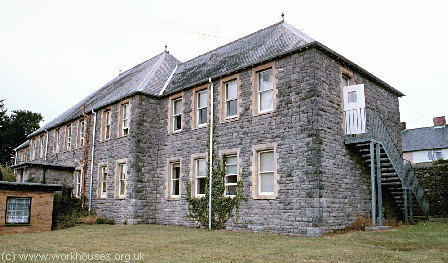 A maternity unit was opened in 1941 and part of the old north-east wing of the workhouse was used as a nursery. 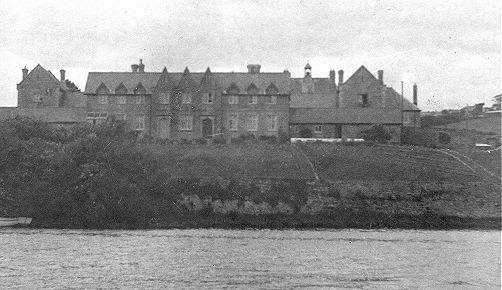 In 1948, the hospital became part of the National Health Service under the name of Riverside. A major remodeling of the buildings began in 1960 with the demolition of most of the old workhouse building. Now run by the County Social Services Committee, Riverside continues to provide care for the elderly. Pembroke site from the north west, 2000. 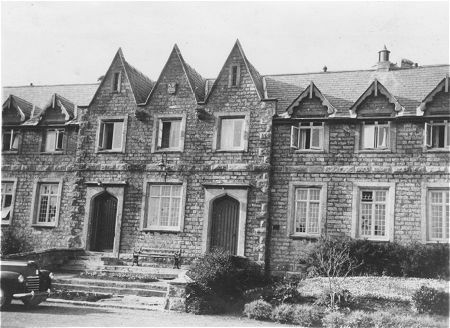 In 1912, the Pembroke Union purchased a property known as Croft House, on The Green, near to the workhouse, for use as a home for up to 40 children aged from five upwards. They were given instruction in gardening, household duties, and cooking from two 'industrial teachers'. 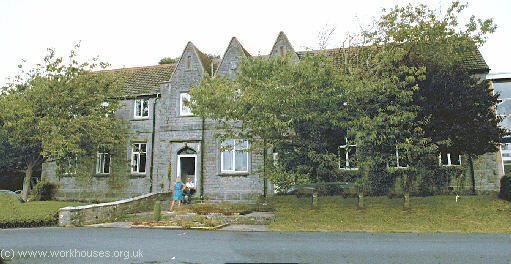 Pembrokeshire Archives, Prendergast, Haverfordwest SA61 2PE. Holdings include Guardians' minute books (1839-1928, with gaps); Register of inmates (1905-55); Admissions and discharges (1912-15); Births (1866-1913); Deaths (1837-66); etc. Hughes, Clive (1989) Riverside 1839-1989 Commemorative brochure (Dyfed County Council). Thanks to Lyn Shore for pictures and information on Pembroke.